While (unfortunately) the killing of police officers is common in the United States, it isn’t, in Wales. When two of them are brutally murdered on a remote country road, the country is in an uproar. Worse, the killer leaves nearly incomprehensible messages to taunt law enforcement with the promise that there’s more to come. Detective Inspector Ian Drake (along with his partner, Detective Sergeant Caren Waits) must try to figure out who the next victims are, but the killer always seems one step ahead of them. In addition, Drake must battle his own obsessive compulsive behaviors. Plenty of red-herrings along the path, and many other surprises I won’t reveal, make this a super-fast-paced thriller with an ending that Agatha Christie would be proud of. 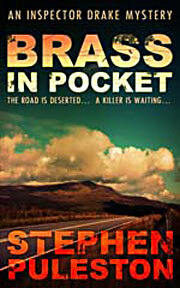 Brass in Pocket is the best of this sort of mystery that I’ve read in quite some time and I look forward to the next book in the Inspector Drake series. Well done, Mr. Puleston!